Announcement My designs are a modern twist on an old tradition. Using primarily quality recycled materials or virgin wool's I draw from over a decade of experience to create rugs, bowls, bags and other items that are designed to last. My goal is to create articles of heirloom quality, so be sure to read more about heirloom rugs in my shop policies. Thanks for stopping by......hope you like what you see! I do custom work, so feel free to contact me to see if it can possibly be done. I will ship internationally, please contact me with your location for a shipping quote. My designs are a modern twist on an old tradition. Using primarily quality recycled materials or virgin wool's I draw from over a decade of experience to create rugs, bowls, bags and other items that are designed to last. My goal is to create articles of heirloom quality, so be sure to read more about heirloom rugs in my shop policies. 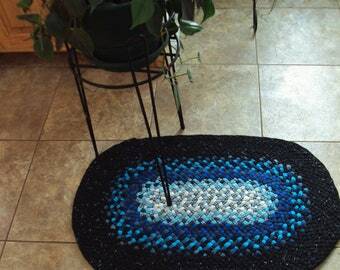 I love this rug! The colors are gorgeous, craftsmanship is impeccable, and it looks so wonderful in front of our wood burning stove. It was a pleasure doing business with Kathy! Such a beautiful little rug...the colors are just perfect on coffee bean colored carpet! Here is where you'll find me most of the time....doing what I love! I grew up when green was just a color and sustainability meant outlasting my older brothers in a game of tag. Being the oldest daughter, the fourth of nine siblings, I learned at an early age the value of using whatever material was available to create whatever was needed for the family. "Store bought" was not a common adjective used in our house. I honed my sewing skills by having to re-design clothes from my fuller figured cousins and watched carefully as my mother produced amazing designs with her crochet hook. When the time came for me to leave home, time seemed to become my enemy to my creative ideas. Jobs, marriage, and starting my own family seemed to steal any free time. As the family grew, those basic sewing and crocheting skills assumed a more important role in my life. Using the quiet hours when the children were in bed to sew clothes for my nine daughters, or one son became a special time of personal rejuvination and satisfaction. The free time became more plentiful, or maybe I just took the time, and my desire to expand my craftiness grew. 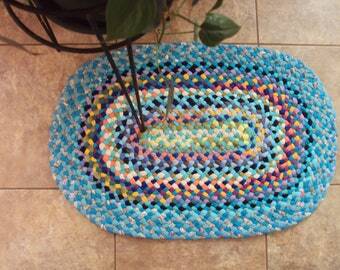 When we remodeled our house to add an extra room for the boy, I decided a braided rug was the answer to decorate the entry way. I had a pile of material, the need for a rug, and the fortitude to try it. So ready for the winter of 1997, my first braided rug graced our home; we still use that rug, but it has been "demoted" to the mud porch. As my second daughter was studing textile design at the UW-Madison, she introduced me to one of her instructors who also was a designer/decorator specializing in floor coverings. The light was turned on! Not only could my braiding be my creative relief, it could also be profitable! As I explored the braiding design and technique books, it struck me that braided items did not have to be flat. Baskets, bowls, purses, a whole new world seemed to open up for me. It is an exciting time in my life, but my most fulfilling projects are still being able to take discarded materials and create heirloom pieces that will last two or three lifetimes. Welcome to mrsginthers shop and for stopping by. Here is where you'll find hand braided items of all shapes and designs. I enjoy designing and creating one of a kind items; and because no two pieces are ever alike, they make truly unique gifts or decorating accents! My goal is to create heirloom quality pieces; rugs that are designed for generations of daily use. 1) High quality materials-predominantly wool. 2) Consistent braids, firm, but flexible to allow the rug to adjust to stresses and humidity. 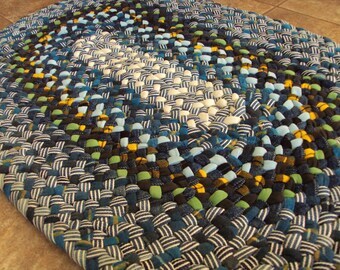 3) Tight lacing gives rug extra durability. 4) Heavy lacing cord concealed inside the braid to protect the cord from abrasion. 5) The finished rug should be a little stiff when first placed and may require two to three weeks to relax to fit your floor. 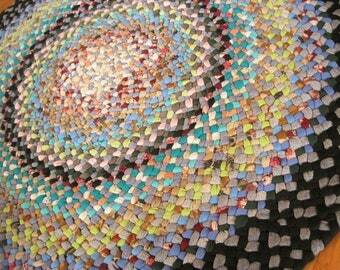 When I do use recycled materials in my rugs, I only use strong materials that have a lot of life left. So please look around and feel free to contact me with any questions you might have. Thank you for your interest in what I love best! Please contact me if there is a problem with your purchase. I generally do not offer refunds, but I believe almost any issue can be resolved with honest communications. Customer satisfaction is very important to me, my products are for your enjoyment, so please let me know as soon as possible if any problems arise. In the continental US I ship first class or priority mail w/delivery confirmation for safety and peace of mind. My goal is to ship your order within 3 business days after payment is received. Shipping and handling on custom orders will be discussed at the time of order. On international orders please contact me with your location for a shipping quote. Any import fees, duties, and taxes incurred as a result of an international purchase are the responsibility of buyer. Because my work is so labor intensive, I do not offer wholesale prices at this time. I would love to make a custom order for you. If you don't see what you want here, contact me to discuss your options. I require a 50% non-refundable down payment up front with the second half and shipping costs due upon completion of rug. While I do my best to take accurate pictures, be aware that colors may appear differently on your computer monitor.